Spring and summer are the prime time for blockbuster movie releases. Movie-wise, this is one of our favorite times of the year! Post-Christmas movie releases are typically not very exciting. However, let’s get back to the positive. 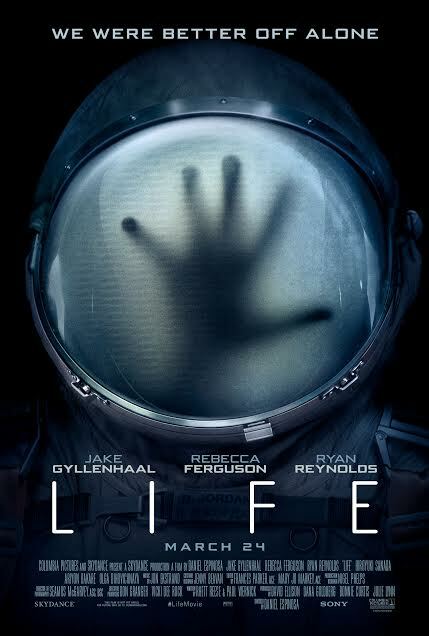 One of the movies we are really excited about is Life featuring Jake Gyllenhaal and Ryan Reynolds. 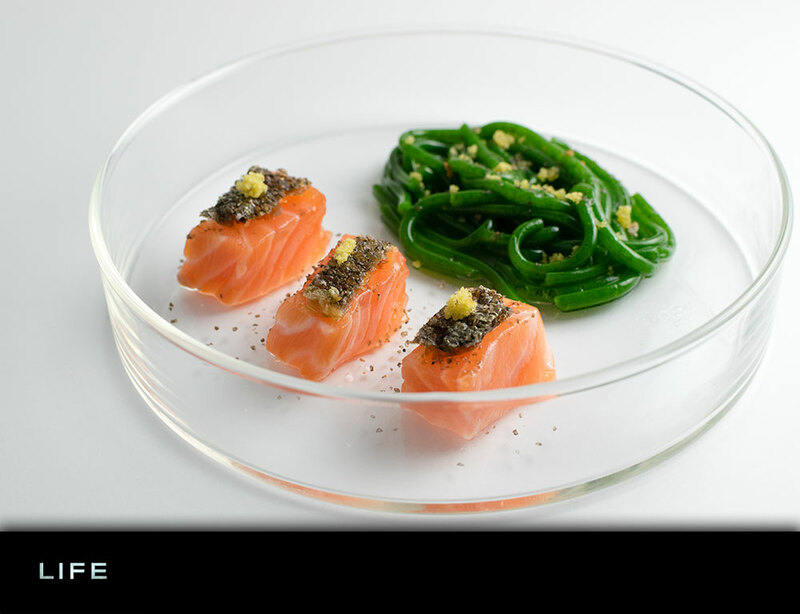 To play up the science tone of the movie, we used molecular gastronomy techniques to create a Salmon Crudo with Crystallized Fennel and Spinach “Pasta”. Life is a ” terrifying sci-fi thriller about a team of scientists aboard the International Space Station whose mission of discovery turns to one of primal fear when they find a rapidly evolving life form that caused extinction on Mars, and now threatens the crew and all life on Earth.” Knowing this about the movie, we felt that we needed to create a recipe that was reminiscent of something that would come out of a lab rather than a kitchen. Molecular gastronomy techniques are a perfect way to do this! Molecular gastronomy is a subdiscipline of food science that seeks to investigate the physical and chemical transformations of ingredients that occur in cooking. We used a technique called gelification. By using agar agar, we were able to turn spinach and water into a “pasta”. We paired that with raw salmon. To add some texture to the dish we fried the salmon skin, returning it to the pieces of salmon. 4 pairs of tickets to an advanced screening of Life on Wednesday, March 22nd at Harkins Scottsdale 101 at 7 p.m.
A Grand Prize Pack including 4 screening tickets, a water bottle, 4-in-1 charger, and a poster. Our winner will be chosen on 3/20! Have you ever tried any molecular gastronomy techniques? Let us know your favorite technique in the comments below! Good luck! Prepare a bowl with ice water. Blend spinach and water until juiced. Combine spinach liquid and agar agar in a sauce pan. Bring to a boil and lower heat to simmer (this will keep the mixture warm while "pasta" sets). Tie tube into a loose knot. Fill syringe with spinach gel. Fill silicone tube with mixture. Submerge in cold water for 3 minutes. Fill empty syringe with air. Spray a frying pan with a little bit of cooking spray. Allow pan to heat up. Once heated, add salmon skin and fry until crisp. Meanwhile, chop raw salmon into small cubes, about 1/2-3/4 inch cubes. Carefully cut salmon skin into the size of the top of your salmon cubes in the amount of salmon cubes cut. Divide pasta between 4 plates. Divide salmon cubes between the 4 plates. 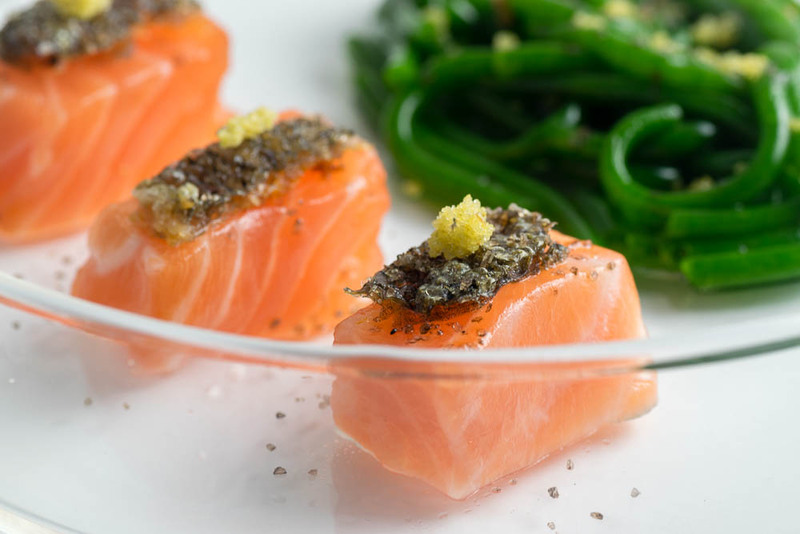 Top each salmon cube with a square of salmon skin and a grain or two of crystallized fennel and a sprinkle of smoked salt. Sprinkle fennel crystals and smoked salt over spinach "pasta". *The Geeks received no compensation to facilitate this write-up; opinions are wholly our own. Prize pack and tickets provided by Allied Marketing. View our Disclosure Policy for more info. I do the PR for Andaz Scottsdale and I wanted to add you to our media lists. What is the best email to reach you at? I will email you my contact info! Thanks! 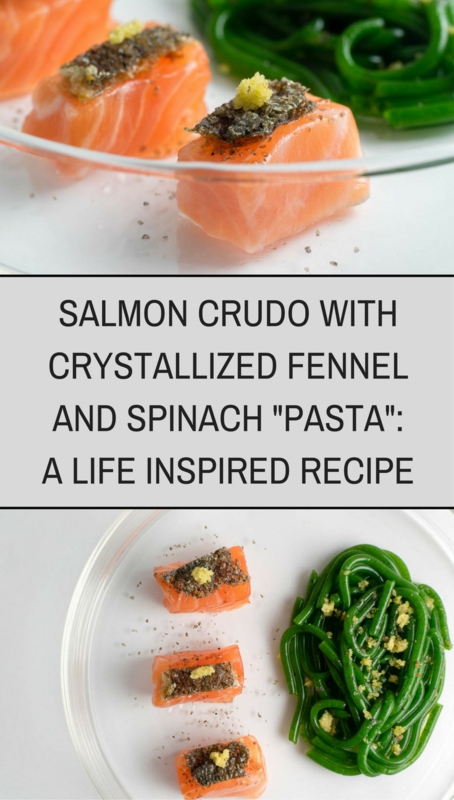 oooh, just imagining how amazing the silky salmon would be with the crispy skin… and if you didn’t mention that the “pasta” was spinach + water, i would have thought they were green beans!